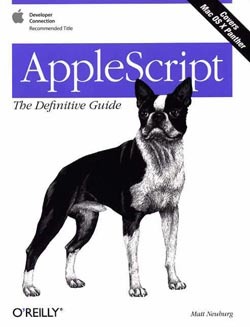 AppleScript, the Definitive Guide (AtDG) by Matt Neuberg is a must have resource for anyone who is serious about using AppleScript. Notice that I did not say, "learn AppleScript." The focus of the book is on how to understand and apply the intricacies of the language to their fullest. The book begins with an introduction to the language, like most programming books, but quickly departs from the normal format of writing a "Hello World" script in order to deal with more advanced issues. The entire second section of the AtDG deals with the internals of AppleScript, from data scopes and declarations to coercions, commands and scripts. The third section of the book is devoted to applying AppleScript to solve real world issues. Topics in this section include using AppleScript to script other applications, working with Unix commands, and building stand-alone applications. The best thing about AtDG is the use of examples. Small focused examples are used liberally throughout the book, each illustrating a particular point in about eight lines of code. This is much more efficient than large examples that illustrate multiple points at once. There are several good books available to learn AppleScript, but most lack the depth to serve as a reference for serious use. AtDG would work as a first AppleScript book for a seasoned programmer, but its true strength lies in its long-term use as a reference.